update:: whoa, those little red hearts are popular! the whole batch has now been spoken for and will soon be on their way to new homes in canada and australia. 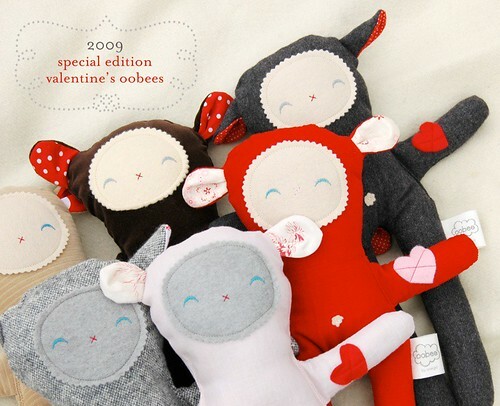 if anyone is heartbroken that they missed out, i think i can fit in a couple more custom valentine oobees. the cost is the same, $32 USD or $35 AUD plus shipping, just send me an email at leslie::dot::keating::at::gmail::dot::com and we'll work out the details. they are super cute! love your blog stumbled on it through clicking a million links! nice little corner to find me thinks! will follow you from now on!